Hope everyone had a wonderful fourth of July weekend. I'm not sure why but lately I been all about sandals and summer sneakers. I guess we go through phases and right now I seem to be gravitating more towards comfort on my feet this summer. I'm sure it won't be long until I hug my heels and tell them how much I missed them (lol) yeah crazy shoe lady over here! If you read my last post (here) I told you about a sweet sale Forever21 was having. 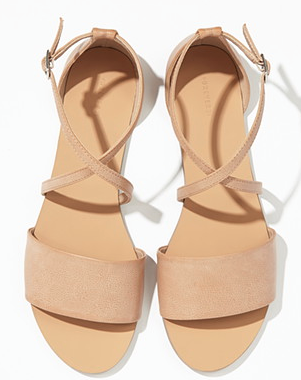 I purchased these comfy sandals that I'm sharing on today's post during that sale. I shot this look over the weekend and I was hanging out with my mom and sister to a local carnival so I wanted to be comfy. I wore this skater skirt with a white lace top. I adore the detailing on this top. It's so chic yet simple. Perfect fresh top for the summer that adds a little bit of detail to a simple look. I added very few accessories and a soft make up look as well as this mini satchel purse. I love simple summer looks! As always thanks for reading. Have a great week!